Crystal Fighters Ready "Cave Rave"
NEW YORK, NY--(Marketwire - Feb 20, 2013) - Crystal Fighters have announced the release of their much anticipated sophomore album. Cave Rave officially arrives on these shores May 28th via Atlantic Records. Listen to "Seperator," the first new track from Cave Rave: https://soundcloud.com/crystalfighters/separator. Cave Rave was written in the Basque hills of Spain, a region that has been integral to Crystal Fighters' sound, having greatly inspired the band's debut album Star Of Love. 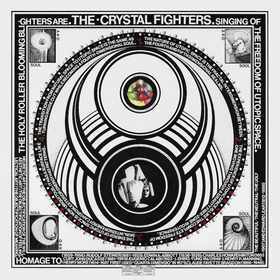 Crystal Fighters then decamped to Los Angeles to record the album with Grammy-nominated producer Justin Meldal-Johnsen (Beck, Air, Paramore). The album's stunning artwork was created by visionary artist, Paul Laffoley. Commissioned by the band, the dense piece encompasses history, architecture, science, philosophy, religion, and transcendent spirituality, all themes explored by Crystal Fighters on Cave Rave. Having established themselves as one of the UK's most exciting live acts, Crystal Fighters will embark on a world tour in 2013. Kicking off in Spain on May 3rd, the tour sees the band throughout most of Europe (France, Belgium, United Kingdom, Germany, and Poland) before crossing the Atlantic for a North American tour in June. See below for tour dates.